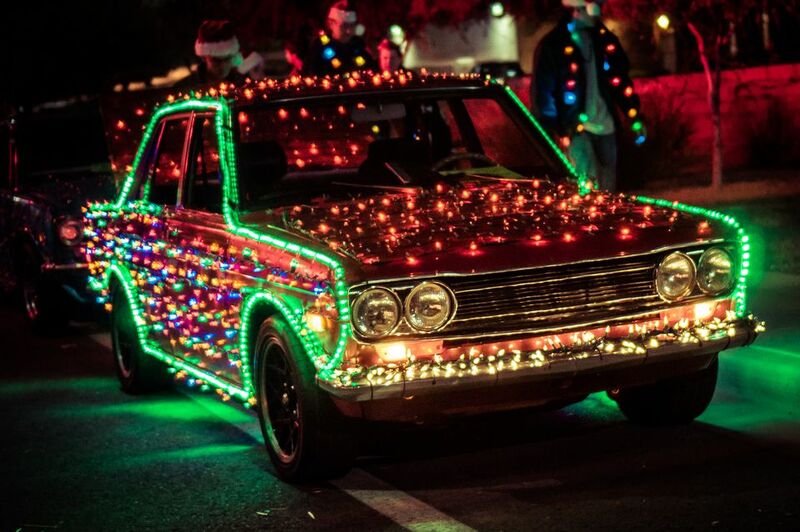 The APS Electric Light Parade, one of the most important and beloved holiday traditions in Phoenix, returns to the streets of central Phoenix on Saturday, Dec. 1, 2018. The 2018 parade theme is Magic of the Holidays. The Electric Light Parade features holiday lights on everything from elaborate floats to marching bands and is expected to attract thousands of viewers along the route. In addition to the floats, performance groups and bands also will take part. It's a celebration that is especially fun for the children in your family. The parade begins at 7 p.m. and travels along Central Avenue from Montebello Avenue to Camelback Road, east on Camelback to Seventh Street, and Seventh Street south to Indian School Road. It lasts for about 45 minutes, but the time can vary. The parade goes on in rain or shine. Bring blankets and chairs so you'll be comfortable along the route. You can bring a cooler for drinks but leave the alcohol and glass containers at home. Parade-watchers often start arriving hours before parade time to reserve spots, so get there early if you want a prime view. You can park on the street if you are lucky enough to find a spot or on a private lot near the parade route. If you want to ditch your car, you can reach the parade route via Valley Metro Rail at the Central and Camelback station. Check with the Arizona Department of Transportation for detailed travel or road restrictions for this event. Call 5-1-1, then *7. The call is free. If you are really into the floats, go to the parade float judging on the Friday before the parade, from 5:30 to 8 p.m. at the event staging area at North Phoenix Baptist Church. There you will see the floats lit up and glittering for official review. You can get much closer to the floats here than during the parade and can see the details. And as a bonus, kids can play holiday games, get their faces painted, and participate in arts and crafts in Santa's Village. They can also get a photo with Santa. Everyone can get into Santa's Village for free. Windsor - Located in its namesake historic Phoenix neighborhood, Windsor is a neighborhood bar and restaurant with a backyard-style patio where they serve wine and beer on tap, cocktails and upscale globally-inspired bar food. Address: 5223 N Central Ave.
Postino Central - Beer, wine, small plates, charcuterie boards. Address: 5144 N. Central Ave.
Lou Malnati's Pizzeria - Restaurant and bar featuring Chicago-style deep dish pizza. Address: 100 East Camelback Road. Joyride Taco House - Cocktails, tacos and American-Mexican cuisine. Address: 5202 N Central Ave. Dairy Queen - Burgers, shakes and ice cream. Familiar American chain restaurant. Address: 5050 N Central Ave.
Applebee's Grill and Bar - Chain restaurant serving beer, wine, cocktails, bar food, salads, sandwiches, and dinners. Address: 2 E Camelback Rd. St. Francis - New American cuisine served in a modern, family-owned restaurant. They offer Happy Hour every-day, healthful meals for kids and a seasonal menu that incorporates fresh ingredients. Address: 111 E. Camelback Road. Reservations for the fine dining restaurants are recommended.